SunEdison has made some big moves into energy storage this year -- first by acquiring startup Solar Grid Storage and its pipeline of mid-Atlantic projects, and then by tapping Imergy’s flow batteries for off-grid projects in the developing world. On Wednesday the solar and wind power developer revealed its plans for California, arguably the world’s biggest opportunity for energy storage, via a partnership with behind-the-meter battery startup Green Charge Networks. Under the strategic agreement, the two companies will jointly market and develop solar-storage projects, each providing its own low- or no-cost financing, with an eye on capturing the lucrative energy-plus-demand charge opportunities in the state’s commercial and municipal sectors. 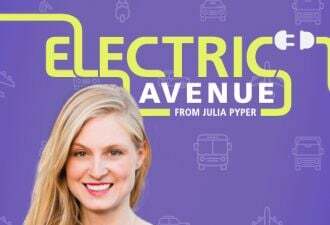 The two have already installed their first project -- a solar array at a parking garage at Santa Clara, Calif.’s new football stadium, backed by Green Charge’s lithium-ion battery and control systems, and connected to SunEdison’s round-the-clock asset management and monitoring service. And while they’re not revealing which customers are next up, SunEdison is actively discussing prospects with a “few of our large strategic accounts,” Tim Derrick, SunEdison general manager of advanced solutions, said in an interview. “There’s been some pull from existing customers, but we’re really seeing a pull from new customers as well,” he said. In fact, “a lot of RFPs from schools and municipalities are coming with a storage component” as part of what they’re asking of from solar developers, he said. That’s a new, but not unexpected, development in the California commercial and government solar market. Solar systems can help big property owners reduce the amount of energy they buy from their utility, as measured in kilowatt-hours. But a significant portion of these customers’ utility bills are based on demand charges, which in turn are based on how much electricity they draw from the grid at any moment in time. Solar may or may not reduce that demand component (measured in kilowatts), but batteries can -- by injecting stored power to avoid spikes in consumption. Alongside New York state, California’s demand charges are among the highest in the country, accounting for up to half of a commercial or government utility customer’s typical bill. California’s Self-Generation Incentive Program also offers lucrative incentives for storage systems, with a particularly smooth registration process for systems up to 30 kilowatts in size, which works for many commercial buildings’ demand charge needs. 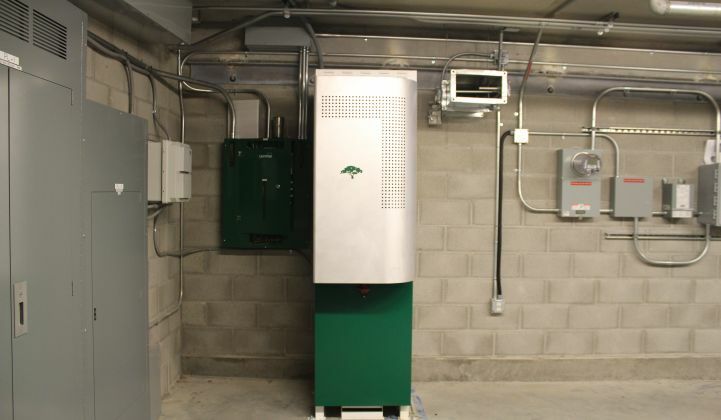 That’s made the state the biggest market so far for behind-the-meter storage systems designed to reduce demand charges, whether from Green Charge Networks or competitors like Stem, Coda Energy, Tesla and SolarCity, or the new offering from electrical equipment distributor Gexpro. The obvious economic benefits of coupling energy generation and demand charge reduction have driven a flurry of partnerships between other solar and storage companies. Tesla and SolarCity started piloting projects back in 2013, and Tesla’s formal entry into the energy storage market this year has accelerated their push. Meanwhile, Stem has inked deals with Kyocera and SunPower to combine solar and batteries for commercial buildings, while Panasonic and Powertree Services have joined forces on the solar-powered EV charger front, much like Green Charge has done with eVgo charging stations from NRG Energy. 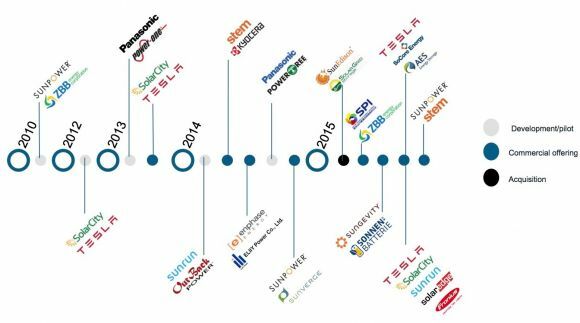 And that’s not even getting into the prolific solar-battery partnerships on the residential front, as this timeline from GTM Research indicates. Right now, SunEdison and Green Charge are each providing their own low- or no-cost installation offerings for customers, via power-purchase agreements for solar and the revenue-sharing arrangement that Green Charge has dubbed its “power efficiency agreement.” For now, Green Charge will continue to work with financing partner K Road DG for the storage part of the equation, Derrick said. UPDATE: "SunEdison and TerraForm Power can finance energy storage in some limited applications today, and we are working on additional financing solutions to bring to the broader energy storage market in the future," he said, referring to SunEdison’s YieldCo, TerraForm Power. Green Charge CEO Vic Shao also noted that the startup has integrated its control platform with SunEdison Services’ renewable operations center. That’s the Belmont, Calif. network operations center that monitors and manages the company’s portfolio of solar and wind assets. The partners aren’t yet putting this potential capability to use, he noted. But both companies are keeping a close eye on the regulations being created in California that could open up new opportunities for solar-backed storage to provide revenue-generating services for state grid operator CAISO, or to help California’s big three investor-owned utilities reduce the costs of upgrading their grid infrastructure as part of their state-mandated distribution resource plans, he said. Derrick noted that SunEdison and Solar Grid Storage are working on a Department of Energy SunShot grant-funded project to develop a “solar-storage operations center” to aggregate multiple storage projects into a single block of charging and discharging capacity. “That’s on the drawing board right now, looking at other ways, other values, other revenue streams we could derive from the battery,” he said. Once again, SunEdison and Green Charge aren’t alone on this front. SolarCity is building grid-revenue sharing agreements into its residential solar-battery contracts, and Stem is bidding its ability to reduce customers’ power consumption into pilot demand-response projects, to name two examples.